Do you want to learn more about window film installation? At Carolina Solar Security, we get questions from our customers all the time about window film installation and what will happen after we arrive at their home or business. 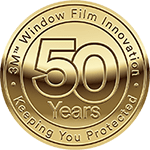 For example, many of our customers want to know how their windows will be prepped, how the film is attached, and how long the process will take. In this blog we’ll give you an overview of the main steps involved in window film installation, and hopefully, we’ll answer any questions that you may have about the process. Typically, a technician will complete this entire process for one window before moving on to another window. Before the window film installation can begin, our technician will first clean the window thoroughly to remove things like debris, dirt, dust, lint, cobwebs, and paint splatter. These would not only negatively affect the appearance of your windows once the film was installed, but they could also cause the film to bubble. Next, our extensively trained technician will carefully measure the width and height of the glass surface of the window. The technician will then cut the window film to the appropriate size allowing about an extra inch of film on each side. The technician will then remove the release liner on the film exposing the adhesive. Using a spray bottle, they will then apply a special solution to the film to prevent lint or dust from sticking to it during the installation. This also prevents the adhesive from sticking to the glass too quickly before bubbles can be removed. Our highly experienced team member will then carefully position and apply the film to the window. A squeegee is then used to push excess water to the edge of the film where it is removed. This also removes air bubbles. This step is repeated until all the bubbles have been pressed out from between the glass and film. The technician will then use a knife and ruler to trim any excess film. Don’t be alarmed if you notice a gap between the edge of the film and the window frame. A small gap is intentionally left to prevent the film from bubbling and cracking. As you can see, window film installation requires a great deal of precision and know-how at crucial steps. That’s why it’s important to work with an installer with experienced and well-trained technicians. When people attempt to save money by installing window film themselves, they often lose money because of wasted materials from multiple installation attempts. Carolina Solar Security belongs to the 3M™ Prestige Dealer Network, 3M’s most prestigious network of dealers. In order to be part of that network, our technicians have been trained and certified to a stringent set of standards to deliver superior installation. In fact, because we belong to this elite network, our 3M window film installations are backed by 3M’s comprehensive warranties. Want Us to Handle Your Window Film Installation? Carolina Solar Security is a premium 3M™ Authorized Window Film Dealer in Wilmington, NC. We have been providing Southeastern North Carolina homeowners and business owners with window tinting solutions since 1985 and never stop working to bring our customers the best products paired with the most skilled window film technicians. Reach out to us for your free quote today!